The company is folding its Confirmed app in the coming weeks. Since 2015, Adidas has been letting customers reserve highly coveted sneakers (like Kanye West's Yeezys) through its Confirmed app. But that's about to change in the coming weeks. 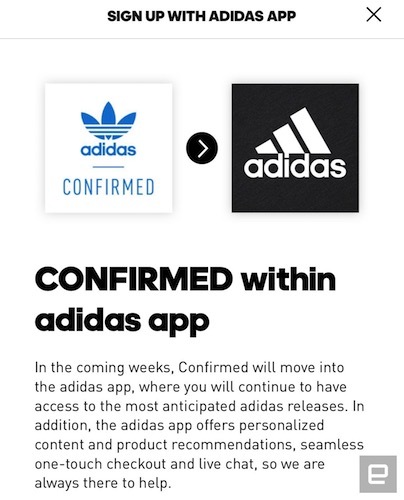 According to a message the company is displaying in Confirmed, the application's features will soon move into the main Adidas app, which was launched in November of last year. Back then, Joseph Godsey, head of digital brand commerce at Adidas, told Engadget that limited-edition drops could be coming to the Adidas app down the road. And, well, it looks like that's finally about to happen. The move makes total sense, since the Adidas app will offer hypebeasts a one-stop shop for all their needs, whereas the standalone Confirmed app only had a very specific use. If you have haven't downloaded it yet, the Adidas app is available for both iOS and Android.